Below is the report of a visit to my village by a group of tourists who arrived there on a yacht. 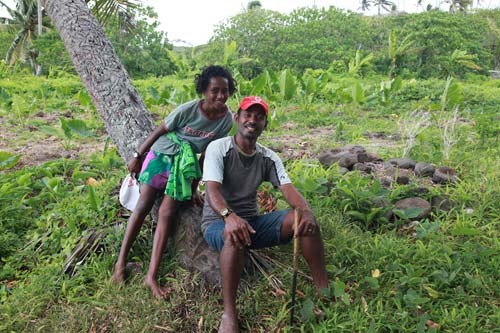 They experienced a typical welcome and stay on a Fijian village witnessing life as lived each day in a village. 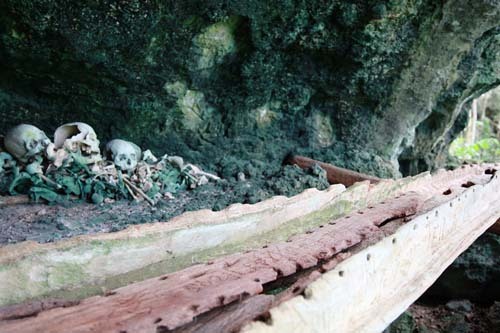 The visit to the cave is one often offered to tourists who want to view and witness the history of my village. The site is of important heritage value to all of us from the village as it recounts the story of our ancestors in repelling the attack of the Tongans in their quest to take over our part of Fiji. I will be posting another entry to elaborate further on the story told here to the tourists about the intentions of the Tongans on my ancestors and other neighbouring islands. 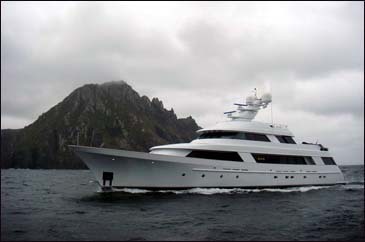 The story below is by the captain of the yacht recounting their experience to friends overseas. Hi Everybody and Happy New Year. Sorry for the big attached photos, but we had a really interesting stop over yesterday that I wanted to share with our friends and family. So our guides who took us up the mountain trail on Yacata island today were telling us they weren't quite sure when this happened but it was during the time of the impeding Tongans into Fiji (invasion began in 1847). The Chief of Yacata, who joined us for the hike, said that his great-great-grandfather told him the story of the Tongans who were captured within their lagoon. They were planning for an obvious attack on the two islands. Yacata and Kaibu share the same reef system and there is a beautiful shallow lagoon between the two. 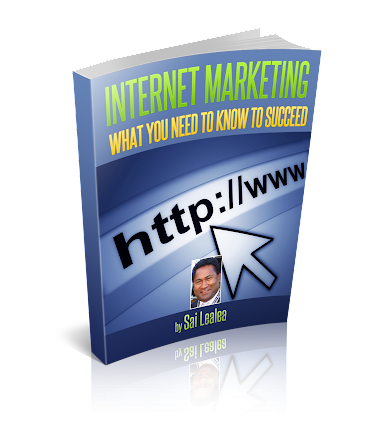 The Fijians saw them approach from their high posted village in the island’s center. The Chief stated that this abandoned village is referred to as village #1 as it is the earliest history that he knows of. Quickly the defending Fijians came down in force and seized the Tongans canoe who put up a fight, and lost. The Fijians loaded the Tongan bodies into their canoe that they had paddled so far across the seas and dragged it up to this cave that we visited today. That evening they celebrated victory with a "Lovo" feast (in ground BBQ with stones and covered by leaves) and ate all the defeated Tongans. 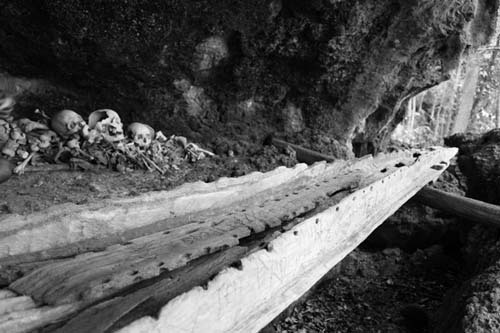 As a trophy of the event they stacked all the bones up in the cave with the Tongan canoe as well. 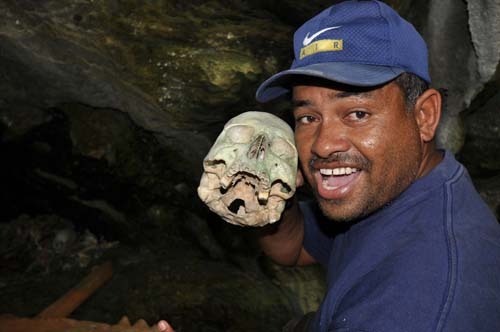 Today only three skulls remain along with many of the other primary bones found in the human body. The young Chief was saying how change was good and that a big part of the change was the arrival of the British Missionaries who taught the Fijians western religion. A big part of that was not to eat other people, because God didn't want them to. He was clear that this "good change" is why it is alright for me to be there today speaking with him and visiting his village, me being white skinned and he, dark. Considering the result of these past uninvited guests I had to agree that change is good. I briefly mentioned segregation in the United States in the not so far off history and how our own change is very good for all the people of the United States. 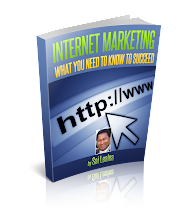 He agreed, and noted that those problems were even more recent than the last time they ate people on Yacata island. Our plans of a visit started with one of our hired Dive Masters (for our 3 week guests trip) mentioning the cave to me two weeks ago. The next door island of Kaibu had had an exclusive, small resort that he used to run for the past owners. The Chief had recently taken Val Kilmer and on a separate occasion, Kurt Russell up to the cave. "Recently" to the Chief could not have been any more recent than 5 years as the guide book indicates that the resort closed in 2005. The only way to get to this resort was by chartered float plane and the cottages, called a Bure here, were around $2500 USD per night with of course a minimum. Makes chartering yachts look cheap. Also there is NO ANCHORAGE! The reef drops straight down to 400 meters with only a slight shelf at a cut from the lagoon that has a wicked outbound current. Captain Carole, our routing agent and Fijian cruise expert with Fiji Yacht Partners, suggested dropping a hook on the ledge and says that the current keeps the ship off the ledge! She then also noted that she had never been to the caves as she was watching the current! A shame, we did the visit in two shifts and the boat drifted nicely at 0.6 knots to the north, away from the reef without anchoring. Anywhere we anchor within reef systems we never drop on live coral, something they don’t worry too much about in Fiji but nevertheless it kills the coral and can take years to rejuvenate. Our arrival was around 0600 and due to overcast skies, we stood off for an hour before launching the small tender. Our Dive Master friend hadn’t been specific about a village being there. On our owner’s three week cruise we quickly learned the protocol of visiting a Fijian village or anchoring in their waters, diving their reefs, etc. Before anything, a shore party must visit the village where they will meet the Head Man of the village. He is sort of the PR fellow and will speak to the chief on your behalf. He will ask the Chief, via a ceremonial presentation of Kava root with a sort of chant that describes the request, if we may visit their lands, waters and be their guests. We experienced this ceremony a few times during the owner’s trip but we had our own Fijian dive master / cultural expert traveling with us and he always handled the presentation. We didn’t need the Head Man then, so for us, this was even more interesting without our own Fijian representative. James, Joe, Virginia and Tracy were in the first shore party as I wanted to make certain of the conditions offshore and how the boat would behave if I would be fortunate enough to make it ashore. They met with Lesi, the village Head Man, and he presented the Kava to the Chief on our behalf. This was after finally finding the village on the windward side of the island. Our contact who described the caves hadn’t mentioned that there was in fact a village. We brought in a Kava bundle in case and very glad that we did. Also when visiting a village women must have shirts on or covered shoulders, shoes (or flops), Sulu (a wrap around the legs-even the men must have sulu), no hats worn or sunglasses. We knew all that so we were cleared and the chief invited us to visit his village and even accompanied both shore parties to the cave. 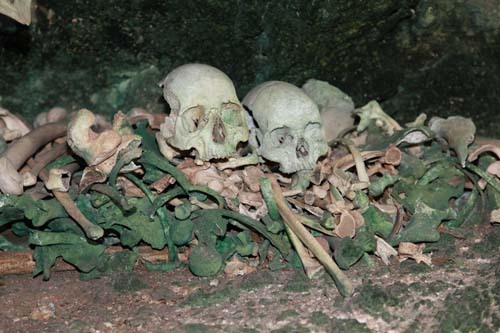 Of the pile of bones, the difference in the bone color is that the greener ones haven’t been handled. The whiter ones are altered / disturbed often enough I guess. 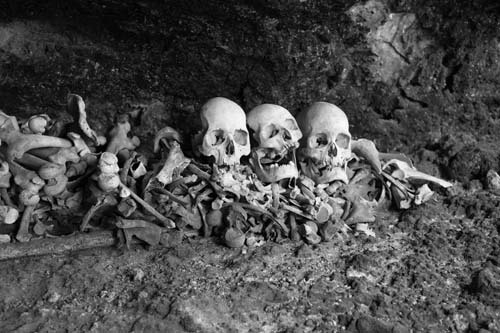 The chief said there were many more skulls, even when he was a young boy he recalls 6. He pointed out how large the bones are and how the Tongans are very big people, strong, people, "good to eat" he actually said! 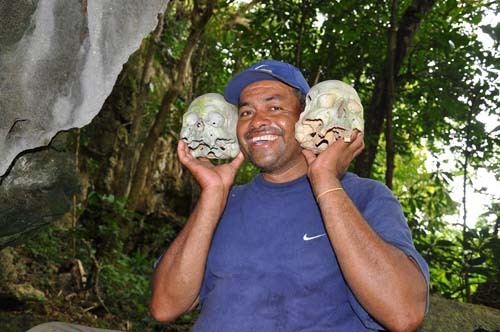 As you can see in the last two photos which, I’m a little reluctant to share, these two, the village Head Man and the village Chief, had no problem goofing off with the Tongan remains. They thought nothing of it as the Tongans were hated, came and simply dominated and took Fijian lands. 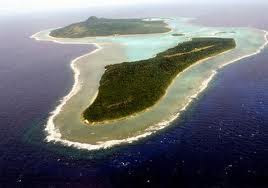 A Tongan Chief, Maa’fu, set up camp on the southern Lau island of Lakaba for almost 40 years (I’m told). The Fijians at the time owed the United States a good sum of money ($40k)and this combined with the intruding Tongans is what lead to the main Fijian Chiefs counsel signing Fiji over to the British, finally in 1874. The British assisted them in running the Tongans out of Lau and also paid off the American debt. Later, after the hike down, Chief said it is good to meet new friends and he has no problem showing the caves to visitors. Lesi had charged us $50 per group (around $25USD) to take us up there and the funds go straight to benefit the village. Our second shore party brought extra sulus, school supplies, candies for the children and a basket full of small stuffed animals for the children. I also brought a second kilo of kava root for the Chief, as we were unannounced on arrival. He asked to give them notice if we brought guests there and later in conversation it was apparent that he was embarrassed by the path on the hike being over grown and that they would cut it back for us. At first I thought we were impeding but he greeted the apology with 45 degree hand-grip-shake on friendship and said not to worry, he welcomes our visit. They kept referring to us a company boat and I carefully described the scene of the family boat where we change destinations and work for only one family. Once this was understood I tried to imply that they should be careful about the cave and that it is a special place to visit, which of course they know to a degree, but also how typical "tourist" would very quickly destroy such a unique historical place. Those last two photos show how they, themselves, aren’t helping the site conservation all too much. I touched on that too, saying that perhaps they should arrange what is left and only handle 1 or 2 if they feel they must exemplify on how big those Tongan boys really were. I said that this would help preserve the site so they can continue to share it with visitors and collect the $50 per trip to benefit the village. If the bones are no longer, then there is only one very interesting story to tell and maybe not as interesting a place as it is right now. 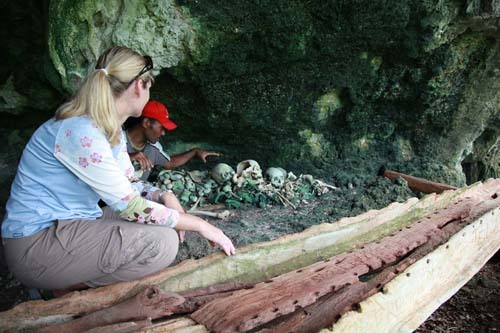 Of course, he explained how there are human bones all over the island. 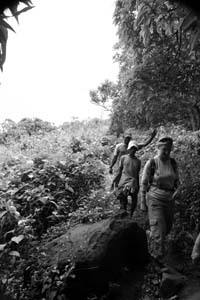 At village number 1 high on the hill they had huge stones they would send down on top of the attackers. 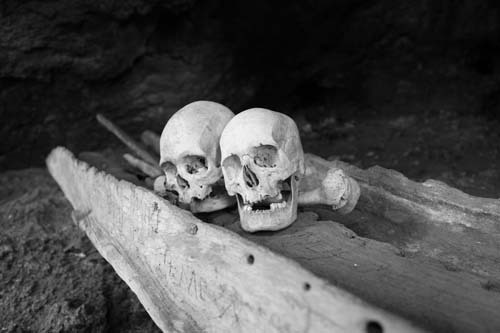 Then later hike down to collect the bodies and have a Lovo feast on the hilltop. Apparently pitching the bones off the hill just like a bucket of KFC. I do hope that the message of conserving the site got through, the Chief definitely acknowledged what I was saying and I was adamant that he understand that I thought it was a special place, special enough to protect. 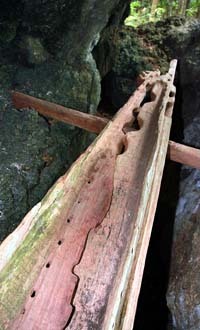 As the photos show it is also pretty amazing that a good section of the Tongan canoe is still intact. Don’t think that these two don’t respect the dead. I’d like to note that the current village, village number 3 as they refer to it, has a wonderfully manicured cemetery with fresh flowers on many of the poured concrete grave sites. I think that the stories passed down from the Chief’s great-great-grandfather left little room for any respect to the Tongans who came to kill the Fijians and take their lands. The village was very manicured and well looked after, as most villages we have seen in Fiji. Everyone we have met is incredibly kind and gracious and enjoy speaking with visitors, once the Chief has welcomed you with the Kava ceremony. This visit to Yacata, where the tourist cannot reach so easily and where they don’t see too many visitors simply due to access, was very interesting. A fascinating place indeed.